Dave started performing at the age of 14 in London’s famous Covent Garden. Years of entertaining classmates but certainly not teachers came to a head and he finally ran away to join the circus. 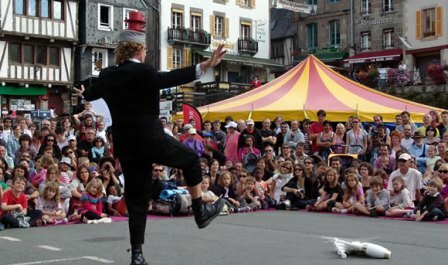 After quickly mastering juggling and unicycling, he teamed up with an old family friend to perform his first “official” show at the 1987 Covent Garden Clown Convention. It was there that his eyes where first opened to the world of Street Theatre and it was love at first sight. After a very successful first year, Dave decided that it would be prudent to expand his skills base and enrolled as the youngest ever student at what was then, Britain’s only Circus School – Fool Time, now Circomedia. He soon realised that there was much more to performing than just doing tricks. With a bewildering array of possibilities at his finger-tips, Dave started to put together what is now the world class indoor and outdoor show, The Great Dave.